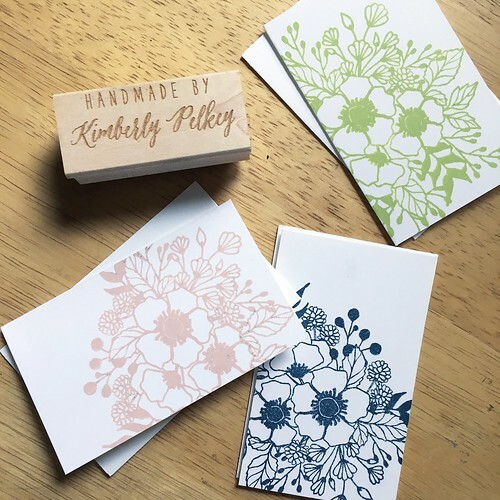 As I mentioned in this previous post, I’ve been making several small 2.5″x3″ cards, including this order of cards made with Wplus9’s Botanical Bunch stamp to be put on display and sold at a local flower shop! I made the cards in four different colors, pale pink, navy, apple green and black. I made sure each card was slightly different by positioning the card base or the stamp in a slightly different way and making sure part of the design ran off the at least two edges of the card – this involved a little bit of masking. 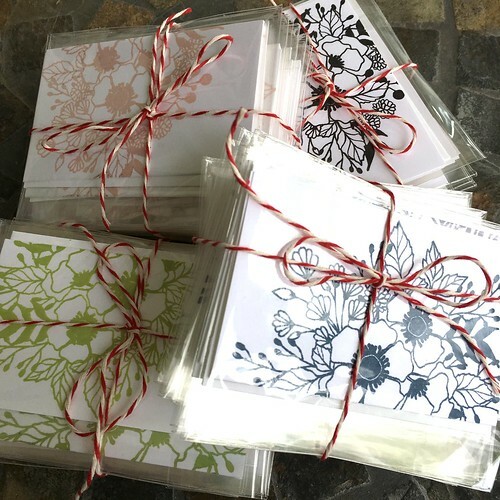 I was able to mass produce the cards really quickly by using my Mini Misti tool. Thank goodness for that thing. It makes stamping out the same image over and over easy, breezy. I paired each card with a baby envelope (ordered from Paper Source) and then wrapped each card and envelope into its own clear plastic bag. I probably could have ordered a smaller size bag, but I went with it. I tied each set of two cards with some baker’s twine just to keep them all together neatly. not a wise idea for Etsy….too much competition now with what you do. I was on there before and during 2010 now it’s just way too as I said competitive. 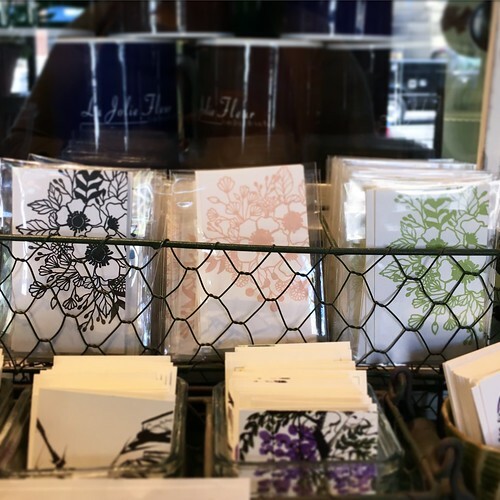 I did cards and such also…its very click oriented the older shops will eat you alive…in other words if you create anything close to someone else using rubber stamps that has been a shop before 2010 they will pick at your shop or try to get your shop closed. Google what I am telling you read it for yourself. The internet has really grown since 2010 so many doing the rubber stamp thing. P.S. 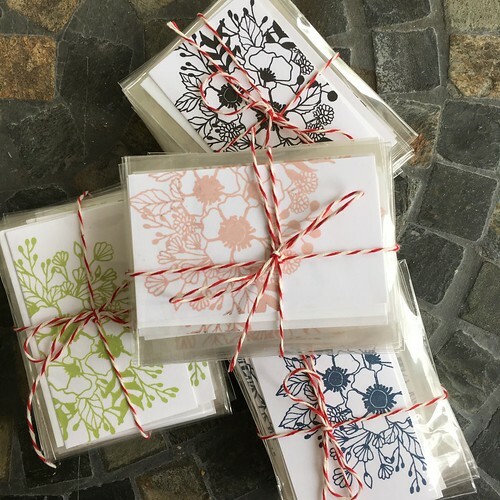 Keep selling to shops locally like you did with these cards…you will fair much better and they appreciate handmade items. It cuts out the shop fees and the hassle of customers. When I bounced off Etsy the customers were very impatient and in return rude in response we are a want it right now society anymore…bearysweetbeads bounced to bigcartel for the same reason and does very well. Love these cards and the stamp! Haha thanks! I haven’t heard if any have sold yet but I hope so!